Is The Bank of New York Mellon Corporation (NYSE:BK) Going to Burn These Hedge Funds? Is The Bank of New York Mellon Corporation (NYSE:BK) a good place to invest some of your money right now? We can gain invaluable insight to help us answer that question by studying the investment trends of top investors, who employ world-class Ivy League graduates, who are given immense resources and industry contacts to put their financial expertise to work. The top picks of these firms have historically outperformed the market when we account for known risk factors, making them very valuable investment ideas. The Bank of New York Mellon Corporation (NYSE:BK) was in 39 hedge funds’ portfolios at the end of the third quarter of 2018. BK investors should be aware of an increase in hedge fund sentiment in recent months, as there were 38 hedge funds in our database with BK holdings at the end of the previous quarter. With 39 bullish investors, BK didn’t come close to be included in the list of the 30 most popular stocks among hedge funds in Q3 of 2018. According to most stock holders, hedge funds are assumed to be worthless, old financial vehicles of the past. While there are over 8000 funds trading at present, Our researchers hone in on the upper echelon of this club, about 700 funds. These hedge fund managers have their hands on the lion’s share of the hedge fund industry’s total capital, and by following their top equity investments, Insider Monkey has identified a few investment strategies that have historically outpaced the market. Insider Monkey’s flagship hedge fund strategy outperformed the S&P 500 index by 6 percentage points per year since its inception in May 2014 through early November 2018. We were able to generate large returns even by identifying short candidates. Our portfolio of short stocks lost 26.1% since February 2017 even though the market was up nearly 19% during the same period. We just shared a list of 11 short targets in our latest quarterly update. Now, it’s time to analyze the fresh hedge fund action surrounding The Bank of New York Mellon Corporation (NYSE:BK). Heading into the fourth quarter of 2018, a total of 39 of the hedge funds tracked by Insider Monkey were long this stock, a change of 3% from the previous quarter. 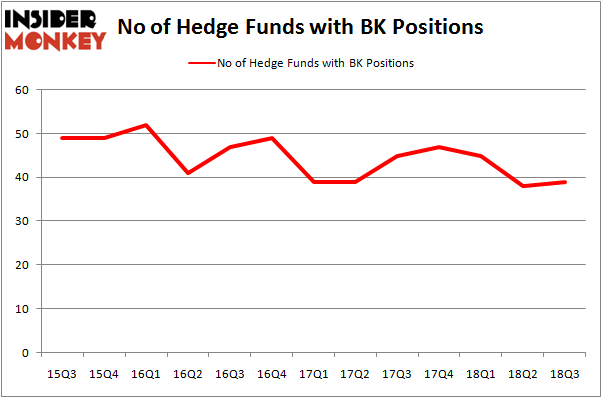 By comparison, 47 hedge funds held shares or bullish call options in BK heading into this year. With the smart money’s positions undergoing their usual ebb and flow, there exists an “upper tier” of noteworthy hedge fund managers who were upping their stakes meaningfully (or already accumulated large positions). 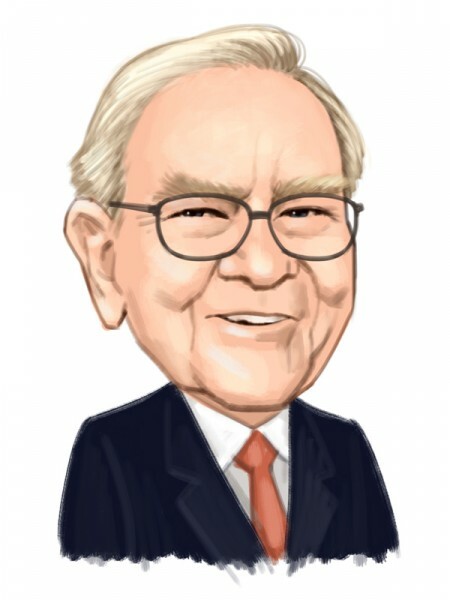 According to Insider Monkey’s hedge fund database, Warren Buffett’s Berkshire Hathaway has the largest position in The Bank of New York Mellon Corporation (NYSE:BK), worth close to $3.9695 billion, accounting for 1.8% of its total 13F portfolio. Coming in second is Trian Partners, led by Nelson Peltz, holding a $822.9 million position; the fund has 8% of its 13F portfolio invested in the stock. Remaining professional money managers with similar optimism contain Mario Gabelli’s GAMCO Investors, Donald Yacktman’s Yacktman Asset Management and Cliff Asness’s AQR Capital Management. Now, some big names have jumped into The Bank of New York Mellon Corporation (NYSE:BK) headfirst. Arrowstreet Capital, managed by Peter Rathjens, Bruce Clarke and John Campbell, assembled the biggest position in The Bank of New York Mellon Corporation (NYSE:BK). Arrowstreet Capital had $7.6 million invested in the company at the end of the quarter. John Overdeck and David Siegel’s Two Sigma Advisors also initiated a $3.7 million position during the quarter. The following funds were also among the new BK investors: Alec Litowitz and Ross Laser’s Magnetar Capital, David Costen Haley’s HBK Investments, and Dmitry Balyasny’s Balyasny Asset Management. Let’s check out hedge fund activity in other stocks similar to The Bank of New York Mellon Corporation (NYSE:BK). These stocks are CIGNA Corporation (NYSE:CI), Norfolk Southern Corp. (NYSE:NSC), ING Groep N.V. (NYSE:ING), and ABB Ltd (NYSE:ABB). This group of stocks’ market valuations are closest to BK’s market valuation. As you can see these stocks had an average of 32 hedge funds with bullish positions and the average amount invested in these stocks was $1.63 billion. That figure was $5.63 billion in BK’s case. CIGNA Corporation (NYSE:CI) is the most popular stock in this table. On the other hand ING Groep N.V. (NYSE:ING) is the least popular one with only 8 bullish hedge fund positions. The Bank of New York Mellon Corporation (NYSE:BK) is not the most popular stock in this group but hedge fund interest is still above average. This is a slightly positive signal but we’d rather spend our time researching stocks that hedge funds are piling on. In this regard CI might be a better candidate to consider a long position.